PyTapDEMON is a project that I am working on for a Python class at UW Extension. It is a Distributed Ethernet MOnitoring (DEMon) using OpenFlow-enabled switch with POX as the controller. This is not a new concept, Rich Groves presented this project at Sharkfest. There a number of reports and commercial offerings on the idea. I believe this has a lot of potential in offering a cheap, distributed system that is capable of monitoring datacetner-scale networks with extensible capabilities. 1. 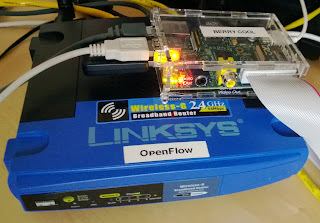 A Linksys WRT54GL flashed with OpenWRT OpenFlow image, http://www.openflow.org/wp/openwrt/. 2. Raspberry Pi for physical hosts, although virtual host will do also. 3. A dump hub to simulate tap ports.